It is December and most winter birds are here already with the exception of Evening and Pine Grosbeaks. These two species are very irruptive and may be abundant for a year or two and then be completely absent the next several or even many years. Hopefully one or both grosbeaks will come and visit us this year. In our backyard the feeders have been swarmed by Pine Siskins accompanied by House Finches, House sparrows, Red and White Breasted Nuthatches, Chickadees and one lone Junco. Throw in several pairs of woodpeckers and the odd raven and our yard has been really quite busy. The Chickadees and Nuthatches are usually bullied by all the other birds and have to wait patiently for a chance to quickly grab a seed and fly away to eat it elsewhere. They have also developed the practice of feeding rather late in the evening when the other birds have gone to roost for the night and early in the morning before most birds are up. This way they can feed in peace without being harassed by the other birds. This year the two species of "winter" woodpeckers, the Downy and Hairy, seem to have developed an interesting and unusual way of feeding that I have never seen before. 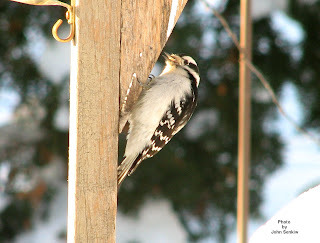 Both woodpeckers fly up under the eaves of our house and feed on something there. It could be insects that were caught in spider webs and were not eaten by the spiders; it could be insects hibernating in cracks in the siding; or, it could be a little of both. Whatever the reason the woodpecker's drumming resonates throughout the house and, though loud, is actually quite pleasant in its own way. In Texas, woodpeckers commonly drum on buildings especially in the spring but around here it is not common at any time of year. Since the recent bout of cold weather our flock of Pine Siskins has abandoned us as have the House Finches and the lone Junco. As a result our nyjer and canola feeders are still full and will stay that way unless the Redpolls come and take over where the Siskins left off. Redpolls are irruptive so there is no guarantee that they will come on this or any given year. We can only hope. The sunflower or black oil seeds have been consumed at an average rate, however, for some reason many of the remaining birds have really been attracted to the peanut feeder this year. So much so, that it looks like this could be the first year that it will have to replenished. 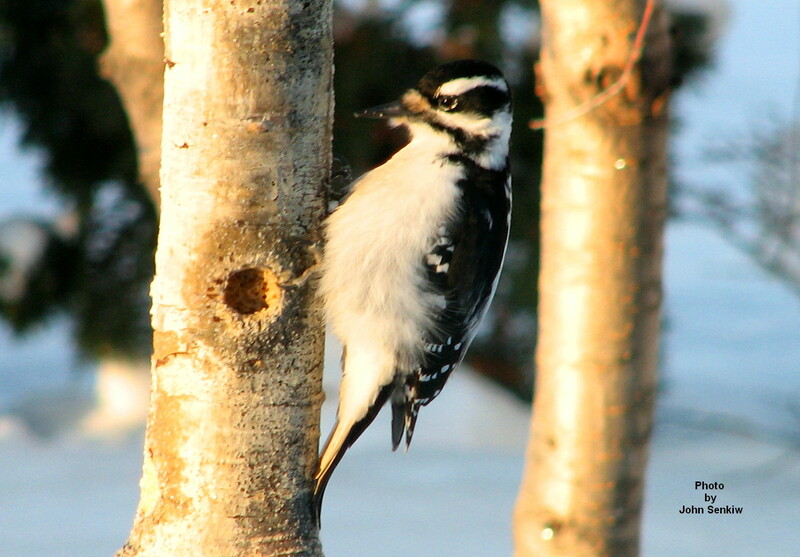 The woodpeckers on the other hand can be found equally at any one of: the raw suet wired to a tree, the peanut feeder or the suet/cornmeal/peanut butter in the log. Being the dominant birds they are the backyard bullies at the feeders. As alluded to earlier we seem to have more woodpeckers than usual this year. There is at least one pair each of Hairy and Downy Woodpeckers regularly at our feeders and often both at once with the Downys submitting to the Hairys. For this week's article I got pictures of the females of each species rather than the males which I usually do. Mustn't be sexist you know. Anyway, for a more in depth discussion of the a Hairy and Downy Woodpeckers see Articles Nos. 27 and 64 respectively.